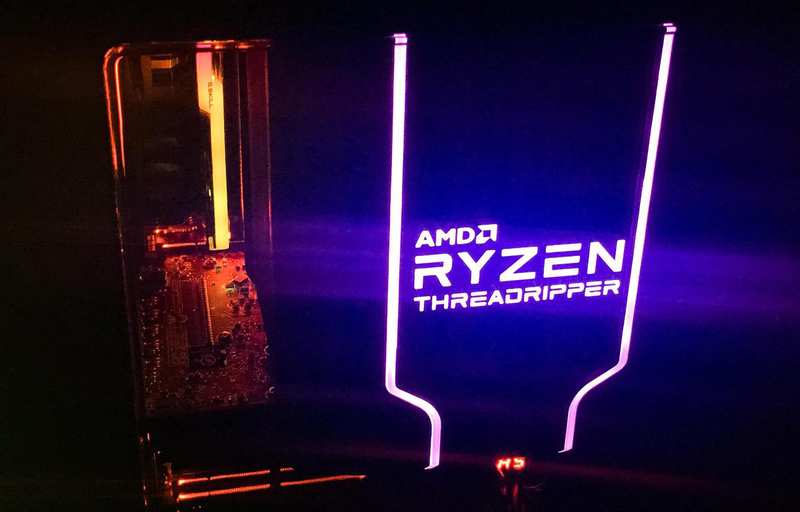 AMD recently held a Threadripper 2 event in Maranello and while we weren’t considered good enough to be invited by the company – we do have some great news coming-in from the event that we aren’t bound by an NDA to not-share (good luck unravelling this sentence): AMD is introducing new Wraith Ripper coolers that will allow its flagship processor, the Threadripper 2990X/WX to hit 4.0 GHz on all cores on air. This is an absolutely incredible feat and is a subtle pun at the recent Intel debacle regarding the 28-core and the aquarium chiller. AMD has been on a roll recently and it looks like their x86 come-back has yet to peak because the company is rolling out brand new wraith stock coolers called Ripper and built by Coolermaster that will allow the TR2 flagship to OC to 4.0 GHz across all cores out of the box! 4.0 GHz on such a mammoth processor, on air, is an absolutely herculean feat. To put this into perspective, Intel required a phase change cooler (which is a step above traditional AIOs) to OC their 28-core to 5.0 GHz. Granted 5.0 GHz requires exponentially more cooling power than 4.0 GHz, it is still impressive that AMD is doing this on stock coolers. As far as I know, no Intel extreme core count processor can hit anything close to 4.0 GHz on a stock cooler. The reason AMD can do this is two-pronged. The first credit goes to the new XFR2 technology that the company is employing in its Threadripper 2 parts. XFR or Extended Frequency Range is AMD’s dynamic OC technology that intelligently clocks the part based on a couple of variables. This is similar to the Turbo Boost tech that Intel employs in its CPUs. XFR2 is the successor to XFR and will allow TR2 to boost much higher than before. Since this is the all-core boost, it naturally implies that single and fewer core boosts will be much higher. 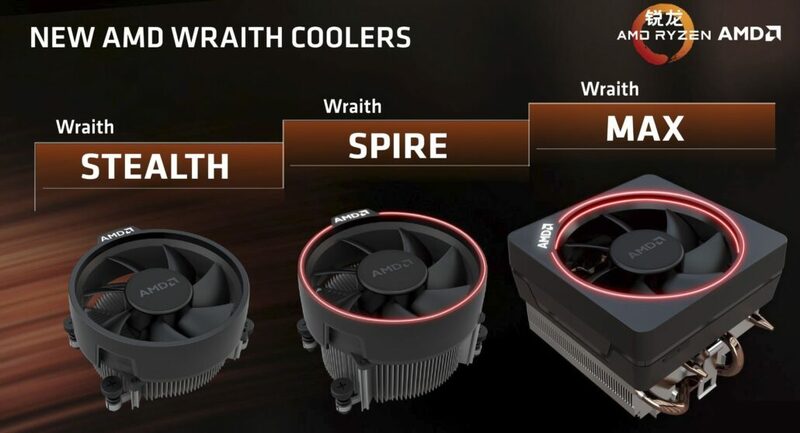 The original lineup of AMD Wriath coolers. The second reason is of course, the hardware. This includes both the 12nm process and the brand new Wraith coolers. It is clear that they are designed to handle thermal loads upwards of 250W with relative ease. The new wraith cooler is an air-based design and is not an AIO – that much we can confirm. I have heard that the company stressed this point multiple times and in fact, the words “on air” were repeated in almost every other sentence. It is clear that AMD wants the narrative to establish a clear contrast between its rival, which required a phase change cooler, and Threadripper 2 which OCs just fine on Wraith Ripper stock coolers. Then there is the 12nm Zen+ process, which allows the CPU to handle higher clocks at cooler temps and is basically the bread and butter of the Threadripper 2 tech. AMD’s processors are maturing really well and the company has already sampled the press with 2990X/WX samples. We can also confirm that the leaks with the processor scoring 6000 points on cinebench are accurate and the AMD Threadripper 2990X/WX will be able to hit that score using the stock Wraith cooler. 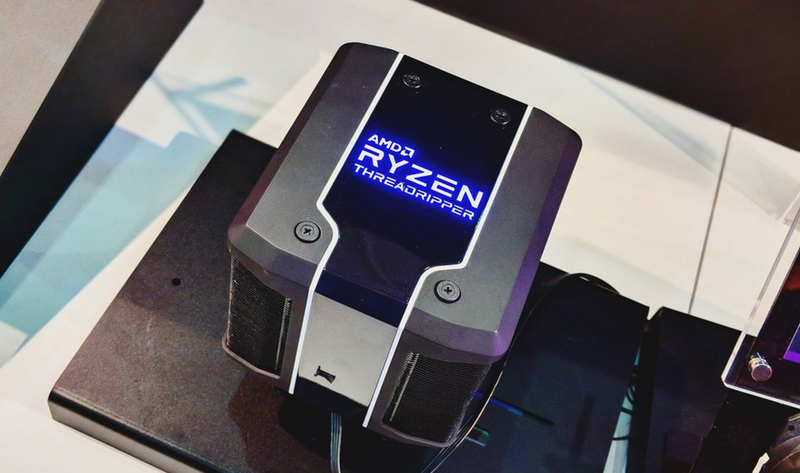 All in all, Threadripper 2 is shaping up to be an absolutely disruptive platform and we can’t wait for reviews to go live. It also means that the pressure is on for Intel to come up with similarly marketable packages and coolers – hopefully without any phase change in the mix.